Ive been looking, but i cant find one; a knitting circle close by. Initially my reaction was "oh bummer, i s'pose thats it then, cant find one, not gonna happen" That would be the sometimes rather thick, non-problem solving, giving up straight away Kel talking. Then my inner lightbulb went on... "so start one". oh poop! my brain automatically darts to the percieved emotional responsibility for the hanging together and successful meeting of a group. Hmmp. Old Kel tape. Insert new one. I think Im up for it...Im not going to be part of a circle if i dont. No choice. Embrace it. Its on my list for 2009. 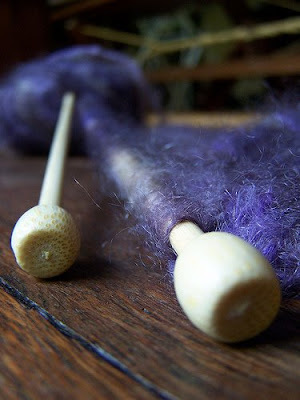 I love the 'idea' of knitting and every winter i get inspired find some wool and set down to make something fabulous. I want to make socks, that beautiful blanket, a jumper for the bean. I can cast on, i can rib, i can drop and pick up and i can do it in the round, until something unidentifiable happens and i cant work out how to solve it. i need to be around knitters who know whats going on! I want to chat, sip tea, eat chocolate, learn to problem solve with sticks and string and make new friends. I started a wonderful bookclub and its still going strong 4 years on...we all get on well and have successfully weathered a few storms and seen new members come and go. But i have never been involved with a 'creative club' like this. So, i have a few questions for those of you who belong to knitting cirlces or any other kinda circle. How did yours develop? was it word of mouth to friends, through local advertising or some other way? Where do you meet? Have you always met here or have you changed location for some reasons? How do you structure the group and the time you are together, if at all? Do you have rules and are there any things that in reflection you regard as really important about running/ being a part of a group like this that i should know? My Mum's knitting group is a word of mouth local thing. Mum's best mate lives across the road from the initiator. They meet at someone's house every month or two. At the end of each meeting (still with needles clicking, and cups of tea being refilled) they start to talk about the next meeting, diarys come out, someone says "I can host" and everyone makes sure they know the address. Whoever hosts sends out a reminder email with the address. Everyone brings something for afternoon tea, sometimes they bring an extra friend. It's all very laid back, and sometimes there's been no progress on the knitting since the last meeting. It's about carving out some kid-free time (or grand-kid free time) to do something for yourself. It's not a competition sport. annuska - as ICG says, no need to perform, in fact attending the 'crcle' may be the only chance i'd get to do some. Come along when i get it up and running. ICG- hope all is OK in your neck of the woods. The tragedy unfolding in Vic with the fires is tearing my heart out. Your mums group sounds just like our bookclub, and i know how to do that! thanks for info.